Good Morning Traders! Wednesday’s trading was a dull range day in many markets excepting Crude, Nat Gas and Cows. The SPs closed with an “Outside/Inside” day pattern, which leads to explosive breakout moves. 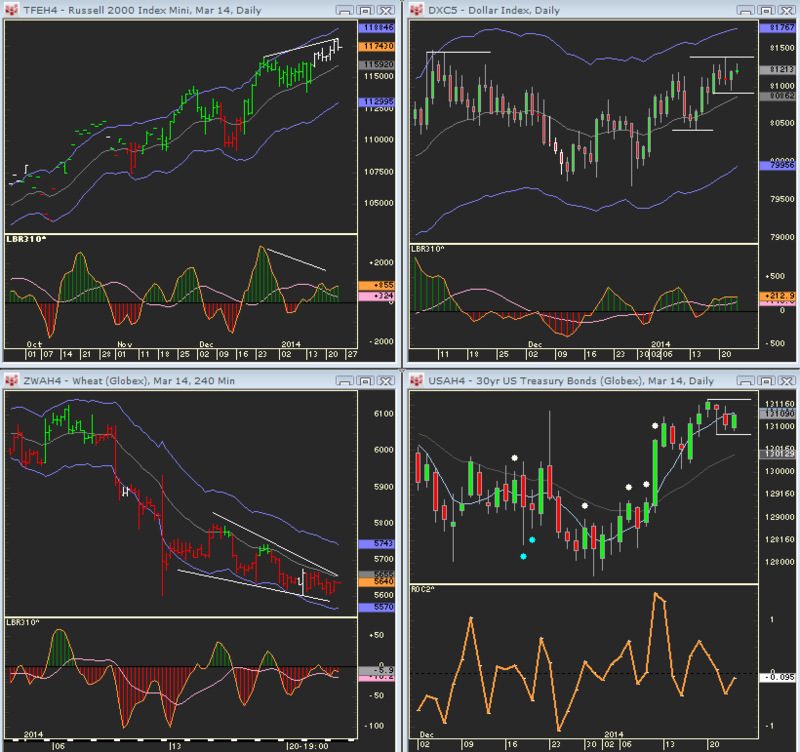 The Dax, Bunds, Bonds, metals and currencies are all poised for breakout moves as well. Many 120 minute charts have converging trendlines. Market internal idicators are neutral. Sentiment readings are near historical extremes, but on the other hand, the trend has been solidly up and even the Utilities and Transports if you are a Dow Theorist have been confirming. Chinese economic data drove the SPs down in the evening session. 36, then 32 were both traded through. This leaves 1826.25 as the last bastion of support on intraday time frames. 1169.20 is the main pivot for the Russell – a breach of this would lead to an outside down day. If this were to unfold, daily sell divergences can kick in. To the upside for the SPs – if we open down, 1834.75 was Tuesdays low. 1836.50 and 1842.25 and 1845 are upside levels to play for. Nat Gas – trend mode up , this can have another low to high day since upside momentum is so strong. Crude – Z day – 2 days low to high but intraday grail buys on the first pullback. AD – Pinball sell and first close above 5 SMA – already testing down in overnight market. Wheat – nice descending wedge on the intraday time frames and deeply oversoldd. Upside = 574 – 580 possible. Bunds and bonds – either direction is possible off Morning numbers. One swing at a time…..